Kochi Prefecture, which was introduced in Ki Tsurayuki`s Tosa Diary, has produced many literary people. Kanbayashi Akatsuki, one of the principal writers of Kochi prefecture and born in Kuroshio Town, was said to be the last I-novelist. The I-novel is a uniquely Japanese development in modern novels, and in particular Kanbayashi Akatsuki expresses the spiritual nature of a Japanese writer in his works. Naoki Matayoshi, who was awarded the 153rd Akutagawa Prize, is also a fan of Kanbayashi`s work and as fate would have it he visited this place in the autumn of 2015. 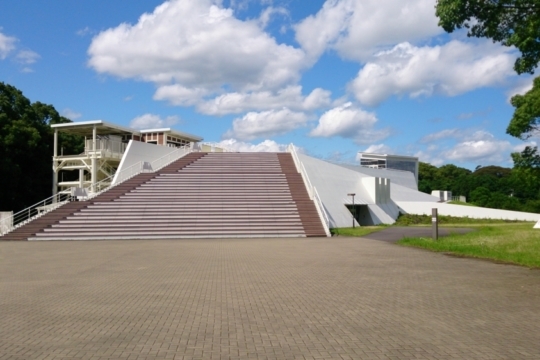 In the Irino pine groves, based on the works of Yasunari Kawabata, the first Nobel Prize winner for literature in Japan, is a monument to the land of Kanbayashi`s birth, and the Ogata Akatsukikan, which honors Kanbayashi`s literature. There in the literature monument you can find an inscription that sums up the essence of Kanbayashi`s literary thought; I think the flowers scattered upon the ground are more beautiful than the flowers blooming in the treetops. Those who grew up in this town have received much spiritual guidance from these words. The flowers that are blooming spectacularly far above our heads are of course beautiful, but we should never neglect the beauty of the flowers that are scattered around our feet. With that in mind, the idea that in this town there is no museum per se, but that the beautiful sandy beach is our art museum, was born. Born in 1902, in what is present day Shimoda Noguchi, Kuroshio Town, he aspired to become a writer from the time he was a student at the Third Prefectural Junior High School (present day Nakamura High School). Through war and poverty to his wife`s illness and eventual death, he would never lose his will to write. He repeatedly suffered from bad luck, and was struck with two major diseases and half paralysis which left him bedridden for 18 years. Yet he had the indomitable soul of a writer and with patience, effort, and the dedication of his family, he was able to write his novels, though it seemed as difficult as carving them in stone. Of his writings, his masterpiece was Hijiri Yohane Byōin Nite, a tale depicting his wife’s battle with illness. His other works include No, which describes his unease relating to his wife’s nursing care, Haru no Saka, set on the Karito slope Ukibuchi area of Kuroshio Town, and more. 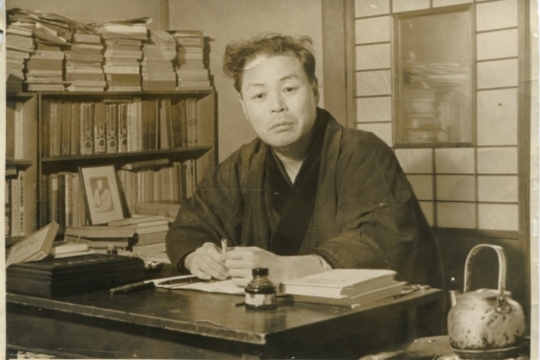 In addition, Shiroi Yakatabune, which he wrote in his sickbed, won the Yomiuri Prize and Buronzu no Kubi received the 1st Kawabata Yasunari Prize for Literature.